Robert Mueller's meaty indictment, accusing 13 Russians (including an oligarch known as "Putin's cook") of "information warfare against the United States of America," shows the special counsel has been doing deep, serious investigative work — totally under the radar, and with zero leaks. Amazing that there was no hint of this in the media. The gist: "The alleged scheme was run by the Internet Research Agency, a troll farm based in St. Petersburg, Russia, which used bogus social media postings and advertisements fraudulently purchased in the name of Americans to try to influence the White House race." We’ve only been reading about [Mueller's] interviews with Trump associates and White House officials — because these are the folks that Washington reporters talk to. But Mueller has been picking apart complicated, secretive and well-funded Russian networks that could only have originated from the Kremlin. Mueller’s indictments are not the work product of some frivolous fishing expedition to indict Trump, as some of Trump’s conservative allies have claimed. This shows that Trump was wrong when he said during a debate that the DNC hacker "could be somebody sitting on their bed that weighs 400 pounds.” It’s not fake news. This shows Mueller has been doing consequential work, not just sniffing around the White House looking for an excuse to indict Trump. President Trump is either woefully ignorant, or deliberately lying, about the scope of Kremlin influence. This was a major Kremlin operation. It will now be even harder for Trump to fire Mueller. Capitol Hill already would have gone crazy if Trump tried that. But after Mueller has done such substantive work — even earning the lavish praise of Trump lawyer John Dowd — it’s impossible to imagine Trump getting away with firing him. The fact that Deputy Attorney General Rod Rosenstein gave a press conference is significant. It was a major vote of confidence in the Mueller probe: This is Rosenstein saying he’s proud of this work, and fully supports it. 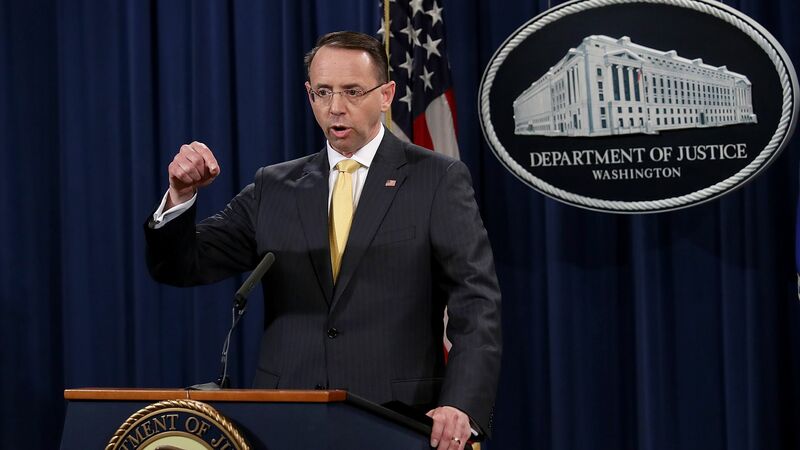 It's also a notable show of independence by Rosenstein — a Heisman to the White House. How it's playing ... Lead story of WashPost homepage: "Justice Dept. deals fatal blow to Trump’s Russia ‘hoax.'"